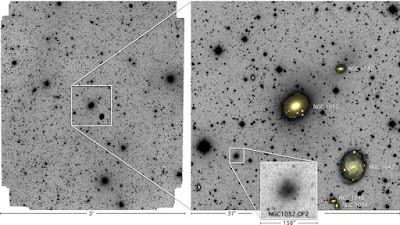 This month an article by P. van Dokkum appeared in Nature on one of the UltraDiffuse Galaxies discovered by the Dragonfly telescope that appears to have little to no dark matter component. 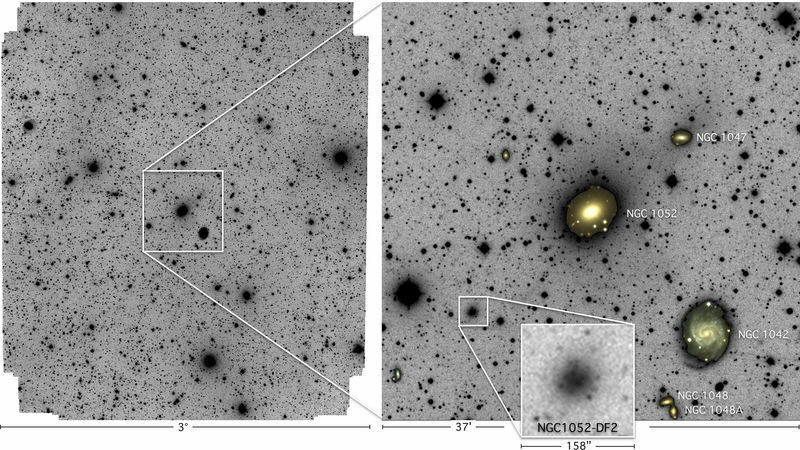 The results were based on follow-up observations with the Keck telescope on the Globular Clusters of this galaxies. 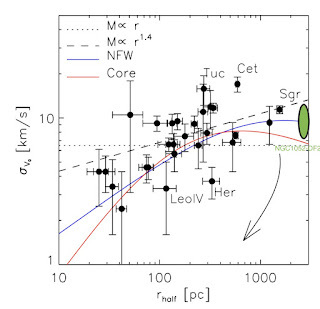 Getting the mass of these galaxies is very tricky because there are only GC left as kinematic tracers; these galaxies have no glowing gas, atomic hydrogen (although that is a supposition as far as I can tell), and the surface brightness is too low for a realistic stellar kinematics map. So GC it is. Nature does a phenomenal job of getting a result across to the media and this result ran around the globe. And, like any good Nature article, it generated a lot of reactions from astronomers all over. To put it mildly, not everyone was equally convinced. The result is based on 10 measurements and we all squinted hard at that. The plot that everyone was just hairy eyeballing a LOT. 1. GC may not be good kinematics tracers. 3. candidate for strong interaction, so not typical UDG. The critical responses kind of split between the MOND (Modified Newtonian Dynamics, aka we don't understand gravity as well as we'd like so dark matter could be just wonky gravity) and comments on the use of statistics on those 10 measurements. First the MOND crowd, who were quick to respond because oddly a galaxy stripped of dark matter is solid proof that it exists: if it's stuff, it can be missing. If dark matter is really a different kind of gravity, one can't take it out of a galaxy, it's an inherent property. which sums up the issue with MOND as "hard to do when other (bigger) galaxies around". So they feel this is not a silver bullet to MOND (yet). 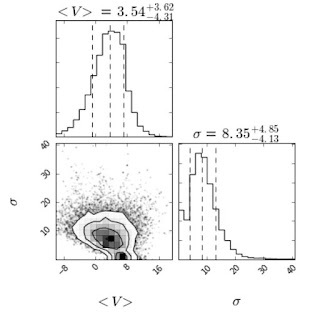 And then there are a number of astronomers who squinted really hard at the use of statistics in this paper. 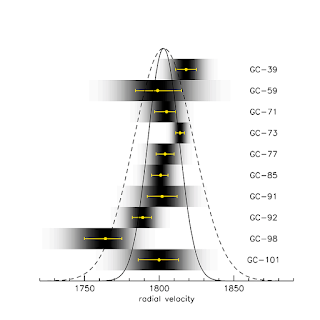 The velocity dispersion of this galaxy is based on said 10 velocities of these Globular Clusters. For one, these are hard to do because the redshift has to be determined from absorption features, not an emission line. Secondly, how does one get from 10 measurements (with high uncertainties) to a dispersion? 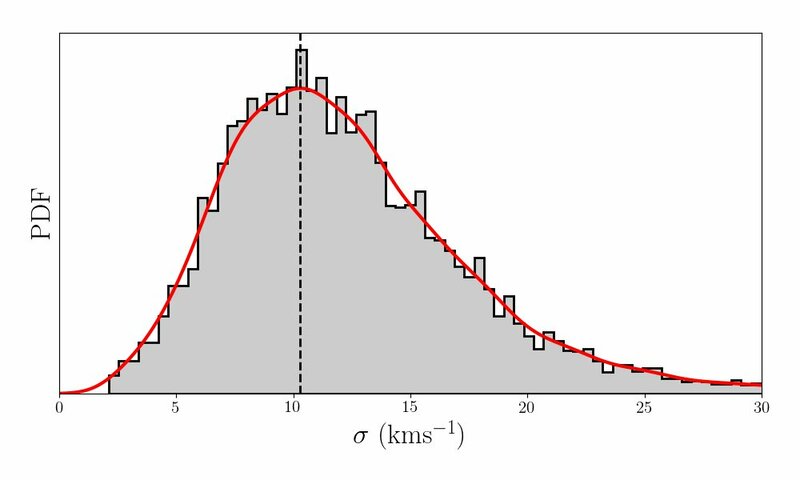 "Bayesian analysis and definitely get results that are significantly higher dispersion (~17-18 km/s 90% upper limit), which would give a mass ~3x higher than the limit here. 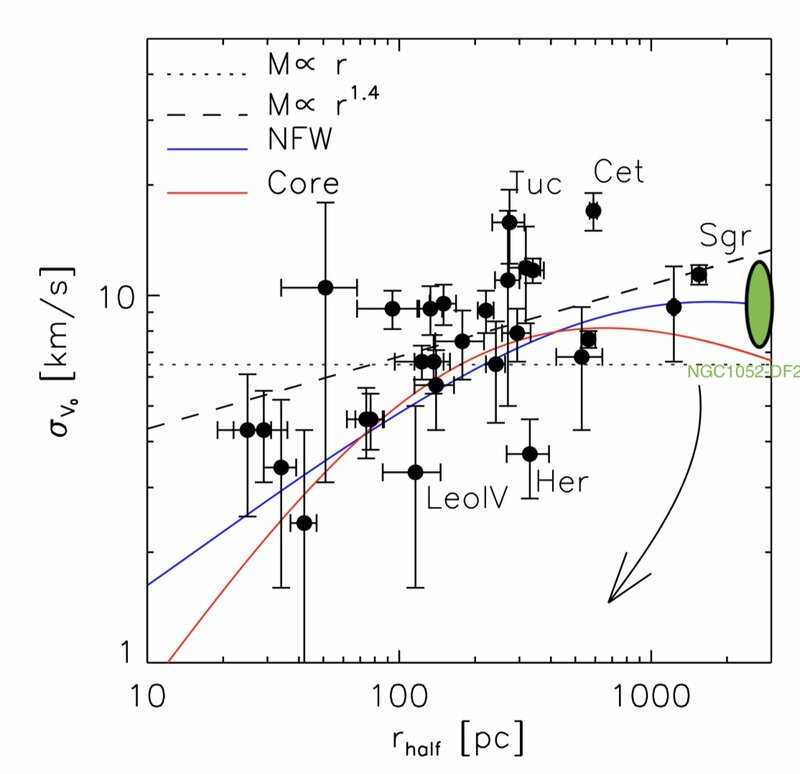 You can throw out their outlier GC and get a dispersion consistent with what they get, but its just 10 data points... Its an interesting result no matter what, but the "no dark matter" seems overstated." The figure shows an MCMC approach to the same problem, which comes up with the higher (still weird) GC dispersion. It focuses on the fact that one of the GC (with also the worst errorbars) is an outlier. Remodeling this, he finds a velocity dispersion that is indeed below 10km/s but with much bigger errors? Sam Vaughan piled on with a longread blog post (here) and a Twitter thread (here) to back it up. Nicely enough, he actually published the code to go with it (here). He points out that with such a result, the velocity data of the GC should have been tabulated. I agree with him on that. Which once again points to a higher value of the velocity dispersion. And both Vaugham and Martin get this tail out to much higher values. While this should not devolved into a Frequentist vs Baysian fight (soo done already) it is clear that the result quoted is heavily influenced by the statistical technique used. Pieter van Dokkum weighed in on a FB comment thread when I was posting on this and wrote a blog post to elucidate. Now to be completely fair to van Dokkum et al. The straightjacket that is a Nature paper does not allow one to completely explain and publish all the analysis or data for the result. Hence the extensive post-publication analysis by others and rebuttal needed on other media. I would point to this paper if anyone asks me what a major flaw in the Nature publishing model is. I would also point to it to show how one best can draw attention to a result. In that respect it worked wonders. 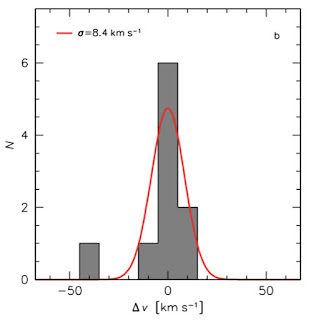 Which is great but how would one then explain the only other UDG with a kinematic mass from van Dokkum+ 2016 (link)? 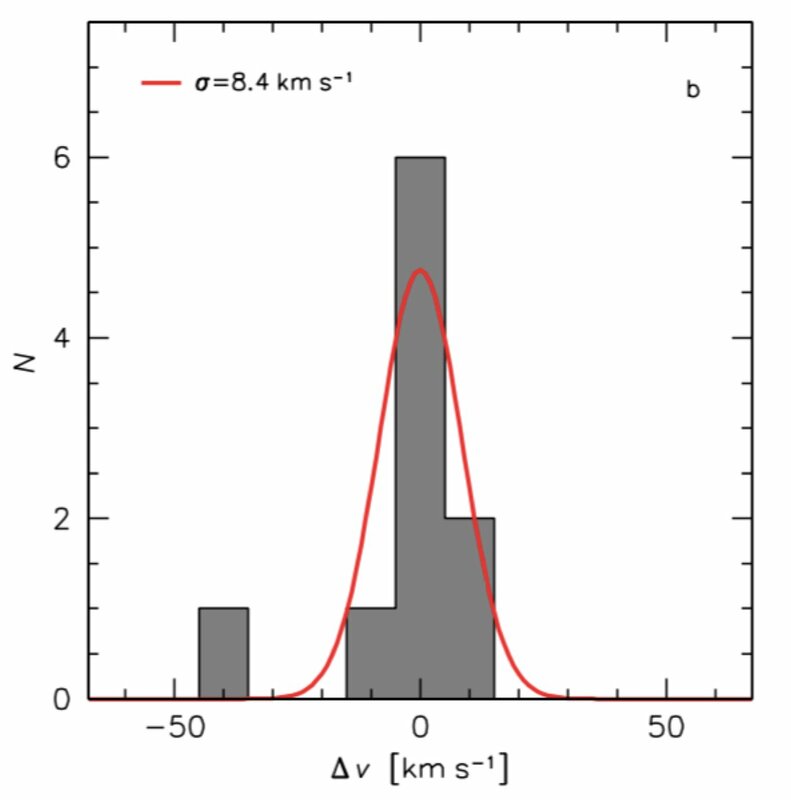 Similar size, much higher velocity dispersion (~50 km/s). A little easy to call it a win just yet. 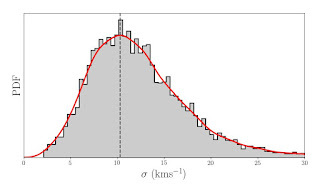 In my view the way forward with these UDG is clear: we need to measure the kinematics of these in (a) more of them, since this has really been an N=2 (galaxies) discussion so far, and (b) using tracers other than Globular Clusters (tricky).